Hot Deal! Colleen Rothschild Discovery Collection Only $49! The Colleen Rothschild Discovery Collection is on sale for only $49 (regularly $95 and it's a $150 value) today through Sunday, March 12th (or until supplies last). 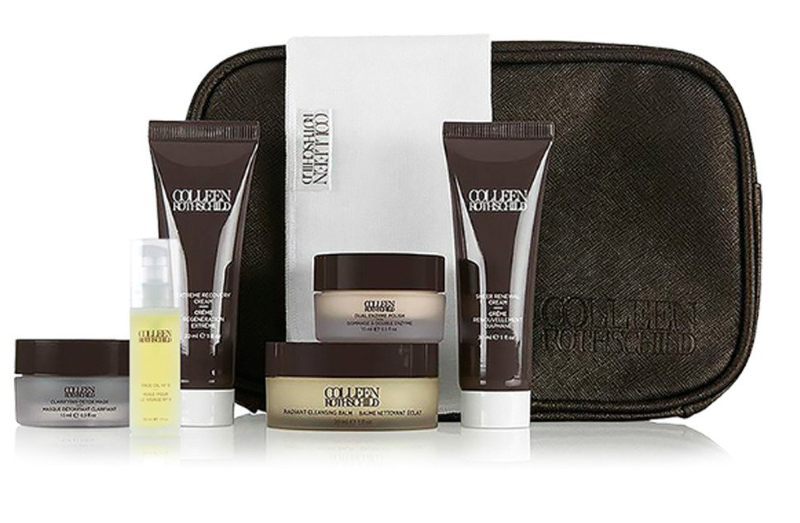 This set contains generous travel sizes 6 of Colleen's best-selling products, plus a muslin cleansing cloth and travel bag. If you've been reading my blog for a while, you probably know that I'm a huge fan of the Radiant Cleansing Balm and Sheer Renewal Cream (read my full review of the Radiant Cleansing Balm and Sheer Renewal Cream here ). I actually purchased this kit (at full price) a while ago and have been using the Extreme Recovery Cream layered with the Face Oil No. 9 at night and it makes my skin feel so plumped and soft in the morning...definitely a must if you have dry skin! If you're looking for a new skincare routine, I highly recommend trying the Discovery Collection from Colleen Rothschild! Several of the products in this kit have become holy grail products for me and my skin has never looked better. I started using Colleen's Cleansing Balm and Sheer Renewal cream because of you and I will never use anything else. Yes they are expensive but they last forever , especially that tube of Sheer Renewal Cream, it's HUGE. I'll be purchasing this kit today and it comes at a great time because my family is taking a trip to the Bahamas for spring break. These travel sizes will be perfect to take along with me. I don't often comment on your blog but I love all of your recommendations and have discovered so many new products because of you! I was trying to steer myself away from buying more beauty-related purchases since I just spent a load on "TheOrdinary" skincare products (which btw, you should check out - it's all the rage right now in the budget skincare world!). But then I read your deal here and was ALMOST going to skip it but your reviews were glowing and couldn't help myself so bought it. I'm excited but this is as much as I would ever pay for skincare products I hope. Oh wow, I've never heard of TheOrdinary...I need to go and look that up right after I finish writing this! I hope you love this set as much as I do...my skin honestly looks so much better after using these products...they really work! The sheer renewal cream intrigues me. Does it play well with a variety of sunscreen formulations? Some moisturizers do; some definitely don't, and I use water-based and silicone-based sunscreens on a regular basis. Thank you! Hmm...I'm not sure because I haven't been using a separate sunscreen, at least not for a long time. I wear the IT Cosmetics CC+ cream which has 50+ SPF in it, and it works great with that. It doesn't sit on top of the skin at all...at least for me (I have dry skin) it sinks in and dries down almost right away.